Are you looking forward to treating yourself to some good Chinese food? Then head to Shang Palace, Shangri-La's - Eros Hotel, New Delhi for an authentic experience. With a 47-year-old legacy, you won't be disappointed. Food on my plate: Lobster and Water Chestnut Dumpling with Beluga Caviar (C), Signature Sizzling Lobster Mapo Tofu (R), and Stir Fried Chicken with Black Fungus, Chilli and Okra. Dim sums, once considered a royal treat, savoured exclusively by the Chinese Emperor and his family, can now be found almost anywhere around the world. But finding a good ‘siu mai’ or a ‘har gow’ can still prove to be difficult. 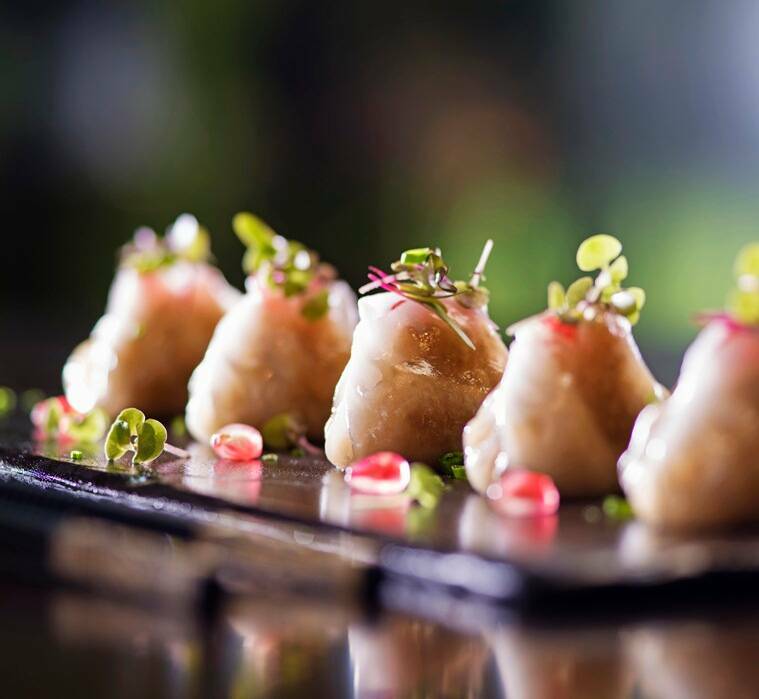 That’s why we were mildly surprised when we were presented with an assortment of dim sums at Shang Palace, Shangri-La’s – Eros Hotel, New Delhi, all the 14 varieties in the new menu, crafted to near perfection. Although reinterpreted for the modern audience, Chef Ye Haijun, the dim sum culinary expert at Shang Palace has done a good job, keeping it as authentic as possible, especially with the xiaolong bao. Soupy and extremely light on the palate, this is how we love our xiaolong bao, with enough meat to add to the texture and the robust burst of flavour in the mouth, with every bite. We also loved their ‘sizzling water chestnut and mushroom XO dumpling’, ‘lobster and water chestnut dumpling with beluga caviar’, ‘scallop har gow with chives’, ‘poached vegetable dumpling’, and the ‘baby shrimp with chilli salt’. However, we also have a list of ‘least favourites’. The ‘baked chicken puff with shiitake mushroom’ and the ‘char siu pork cheung fun’, are only for the die-hard lovers of Cantonese food. 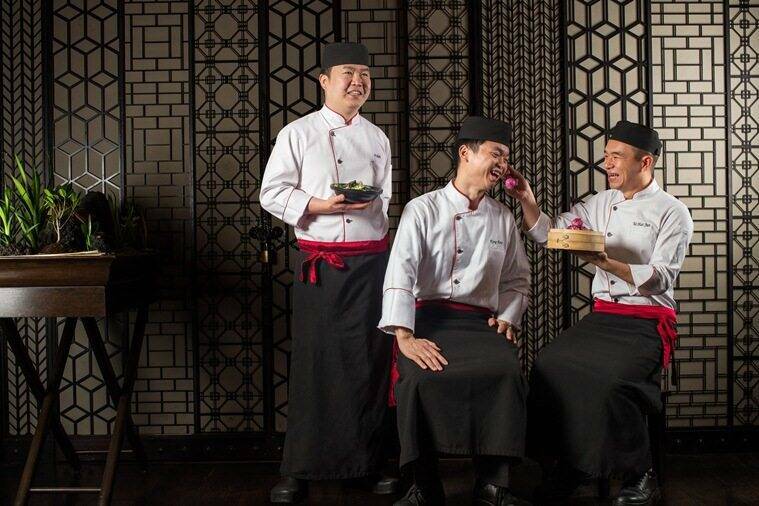 From L to R: Chef Fulei, Chef Kong Fanyi, and Chef Ye Haijun. Moving on to our next courses of Sichuan and Yunnan cuisines, Chef Fulei’s star wok creations, the signature ‘sizzling lobster mapo tofu’, and ‘lamb in Sichuan chilli broth’, made our senses go into an overdrive. We also liked the ‘lamb with okra & chilies’. Quoting the chef, it was culinary heaven. “We have finely curated a delectable line-up of wok for the diners to experience the authenticity of Chinese cuisine in a contemporary space. 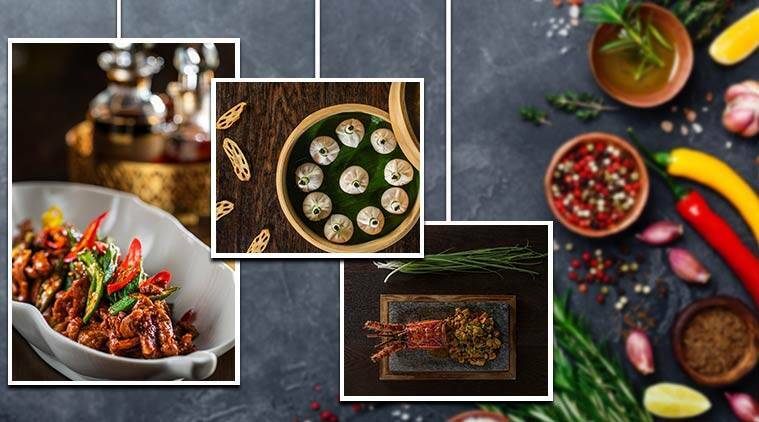 Some of the star dishes include stir fried tenderloin with ceps mushroom and black pepper, and the signature sizzling lobster mapo tofu for guests to indulge in a culinary heaven,” says Fulei. For vegetarians, there are two great choices: ‘fried mixed mushrooms’, and ‘bamboo shoot and mustard greens’. We were equally impressed by Chef Kong Fanyi’s barbeque dishes. We recommend the ‘crispy roasted duck with beluga caviar’, ‘honey glazed barbeque iberico pork’, ‘Beijing roast duck and the roasted pipa chicken’, paired with a Merlot or a Speyside single malt. We would advise you give the cocktails a miss but not the desserts! The ‘caramelized pineapple almond pudding’, ‘Malibu ice cream, and banana confit’ are must-haves. Water Chestnut & Mushroom Dumpling at Shang Palace, Shangri-La’s – Eros Hotel, New Delhi. * Mix all the ingredients to make a soft dough. * Chop water chestnut along with all the mushrooms. Sauté all the ingredients in a hot wok until cooked and dry. Add white pepper, potato starch, salt and sugar. Keep it in the refrigerator. * Now fry sliced onion, mushroom, garlic and ginger until crispy. Add chili oil, dark soy, light soya, salt and sugar. Mix the cold stuffing with this veg XO sauce. * Divide the dough in 20 small balls and roll one by one with the help of a rolling pin. Stuff the mixture and give the dumplings their shape. * Steam the dumplings for 5 minutes. Take a non-stick pan brush with refined oil, sear the steamed dumplings until crispy and golden from the base. * Garnish with fresh pomegranate seeds on top of each dumpling. Serve hot.